It’s a tricky question of judgment and fairness with no definitive answer. Getting the right balance and charging the right royalty-free music license fee can be difficult. Make it too low, you upset composers, but make it too high, you upset clients. It is competitive out there so the temptation is to create a low one-size-fits-all music license fee. Also, there are no guidelines or standard fees to help and it’s a completely open marketplace driven by independent businesses and composers. While some can justify a one-size-fits-all because of its simplicity, this in itself can cause customer confusion. For some customers, the lack of a separate fee per use or an unexpectedly low price for a large-scale use can be off-putting. Also, while composers are happy for Youtubers to use their music for a few dollars, they would be peeved if for example the same music ended up in Microsoft’s new global TV campaign for the same few dollars. 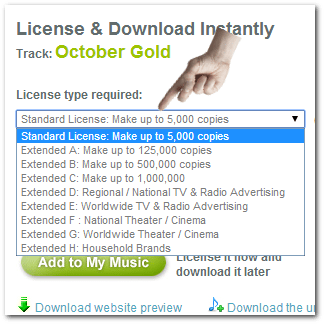 When you consider that licensing mainstream music for a TV advert can easily run into 6 figures, it can be a surprise for an advert producer when they see royalty free music at such a low cost. Here’s the music library owners challenge: most composers don’t like to undersell their creative endeavours, and rightly so, however, there is a need to be competitive but still offer the most straightforward license possible without over-pricing or making it insanely complex. Personally, this is always something we have toiled with and have had to adapt as we’ve grown. You want to create a fair pricing policy but at the same time factor in the creative energy, time and dedication that has gone into creating the music and the continual development and running of the music website. We like to think we are doing this well, and like most of our colleagues out there we are tweaking our terms and pricing to benefit all concerned. It’s always going to be tricky getting the right balance between pricing fairly (to benefit both composer and client) while at the same time remaining competitive and affordable. All you can do is what you feel is right. Feel free to comment and share your experiences.